One of the most widely used drugs to fight cancer could become more effective and safer, based on findings emerging from the lab of UO chemist Vickie DeRose. In two recently published papers, separate projects using different approaches and led by two of DeRose’s doctoral students have made new predictions for where the platinum-carrying drug cisplatin binds in cells. While used for more than 50 years in frontline treatments against several types of cancers, there has been little concrete information on how cisplatin and its derivatives work, DeRose said. Their use also can generate a long list of undesired side effects, including serious kidney problems and nerve damage. Resistance to the drug also occurs. When injected into a patient, the drug goes everywhere, finding its way to both cancerous and healthy cells. Researchers have known the drug finds its way to DNA, RNA and proteins, but little about what happens when it gets there. The two recent studies, both of which relied on high-throughput techniques with yeast cells, shed new light. Using high-throughput sequencing and bioinformatics analysis — methods common in DNA studies but rare for spotting drugs on RNA — Kory Plakos discovered that cisplatin latches onto weak spots, tiny crevices, on ribosomal RNA, the cellular workhorse that carries out the instructions of DNA. His findings were detailed in Chemical Communications, a journal of the U.K.’s Royal Society of Chemistry. His research builds on a discovery in 2011, in which DeRose documented that cisplatin binds to RNA up to 20-fold more than it does to DNA. The ribosome is a sphere-shaped structure in cells that contains RNA and where protein synthesis occurs. In the other study, published in ACS Chemical Biology, a journal of the American Chemical Society, Rachael Cunningham used a click-chemistry process and new platinum molecules developed in collaboration with Michael Haley’s UO lab, in which derivatives of cisplatin carry a small “tail” for tagging. Cunningham used the molecular tail to pull out platinum-bound targets in yeast, isolating 152 proteins. Seven are linked to a cellular condition known as endoplasmic reticulum stress, which affects protein folding and is a recognized consequence of cisplatin treatment. 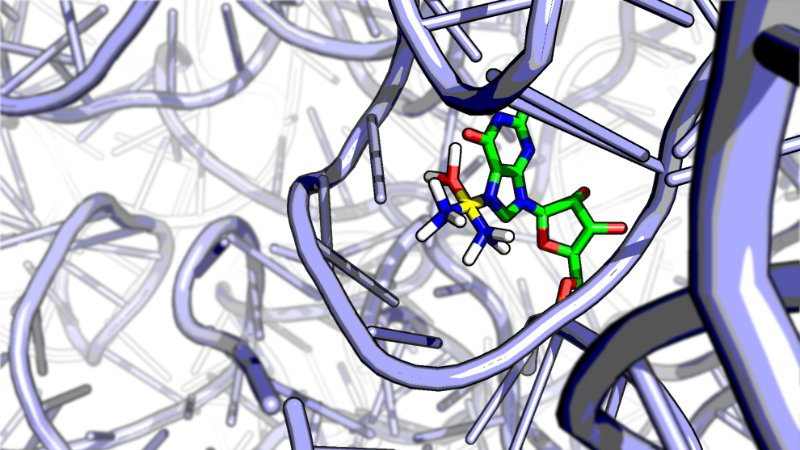 One protein that is crucial to the protein-folding process also happens to carry platinum-loving amino acids in its active site. As the two projects were being done, DeRose said, she was intrigued at the emerging discoveries. She was a co-author on both papers. Yeast as a research model offers simplicity. It is a eukaryote, an organism with many cellular functions similar to those in humans. The next step is looking at human cancer cells, DeRose said. Cunningham was supported by the American Heart Association. Plakos was supported by a National Institutes of Health Training Grant in Molecular Biophysics. Both also participated in outreach activities including the UO Content in Context SuperLessons K-12 program. National Science Foundation grants to DeRose also funded the research.